If the Greek diet is so healthy, why are so many Greeks obese and overweight? This is a common question many people ask me, when they find out who I am and what I do. A recent article from the European Food Information Council (EUFIC) reminded us of what we already know: Europeans are gaining more weight and Greeks in particular have some of the highest rates of obesity. Obviously this is not something I am not aware of, it is actually one of the reasons I started blogging. I won’t lie; it’s very upsetting (and embarrassing) for me as dietitian and as a Greek-American to see these figures. Years ago, Greeks would talk about how in America everything is big in order to accommodate the “big” people: big cars, big XXXL clothes sizes, big serving sizes, etc. but yet here we are now with a large percentage of the Greek population being overweight and obese including children. Many people may be quick to say: “it’s all that olive oil they pour on their food”. I wish it were all that olive oil, I wish Greeks would use only olive oil. But the fact of the matter is that it’s exactly the opposite: Greeks slowly have stopped eating their traditional food, which happens to be one of the healthiest in the world. 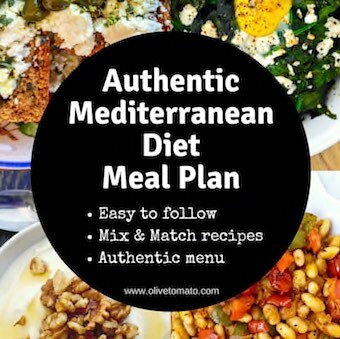 The original Mediterranean Diet was based on the diet of Greece, Crete and southern Italy, and now these very areas are the ones with the highest obesity rates. 1. Greeks moved away from the villages, moved to the big cities and started eating processed and packaged foods. 2. Fear of starvation. Yes it may sound like an exaggeration, but because of all the hardship, wars, poverty, starvation that Greeks have been through over the years, the fear of starvation is still lingering today, especially in older generations. For them a healthy person was someone with a belly, a healthy child was a chubby child. If you could afford it, meat should be on the table every day. 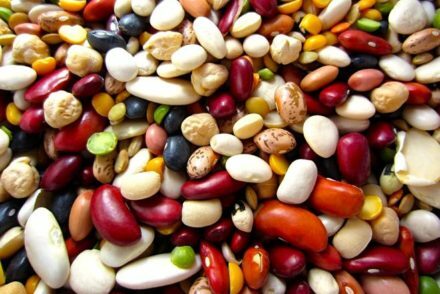 Beans and vegetables were for the poor and less fortunate. 3. Nutrition confusion. While Greeks know that their traditional Greek-Mediterranean diet is healthy, they are getting mixed messages from the media, the food industry and various experts. For years now we have heard that we should reduce our fat intake particularly saturated fat. Margarine was promoted as a healthier alternative to butter. But for Greece, these rules were irrelevant and did not apply: Greeks did not consume large amounts of butter or saturated fats, since olive oil was their main source of fat. In addition, they had some of the lowest rates of heart disease. But yet, today many Greeks are limiting themselves to 2 teaspoons of olive oil a day, using margarine in their cooking, and eating plenty of meat and following an Atkins style diet in an effort to lose weight….and it’s not working. 4. Women began working and either do not cook and order out, or cook quick meals based on meat and starch. 5. Greeks don’t breastfeed their children. Formula is promoted aggressively on so many levels. Unfortunately here too processed foods, special milk, special yogurt, special cookies have been marketed to parents as a healthier and safer choice for their children. 6. And finally a very important fact: Greeks are less active. More money, more cars, less time has lead to less activity. A simple example: as recently as 20 years ago, large supermarkets with parking lots were not very common, shopping was done on a daily basis on foot from the local open market and the local grocery store, even in big cities. Today cars are used for every little errand. So my point is that the traditional Greek diet has nothing to do with the rise of obesity in Greece. Sure they consumed a lot of olive oil sometimes even reaching 45% of total calories, but guess what? The rest of those calories were from fruits, vegetables, beans and fish. Can Greeks go back to the 50’s? No. Can going back to their nutritional roots help? Yes! And not only for Greeks but for many westernized nations. 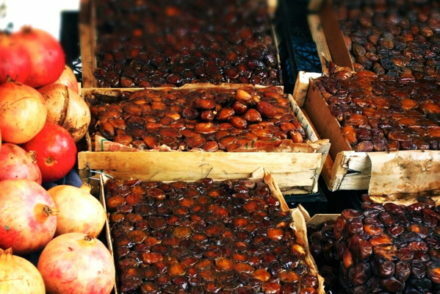 Dates and Pomegranates part of the Mediterranean diet. Thanks Elena. Yes definitely the physical activity. Same problems in big cities in Latin America. Malena, Yes The Mediterranean region and Latin America have many similarities in regards to the obesity problem. Nice blog! I have one of those ‘bellies’. Great post, Elena — you zeroed in with your remarks about the “Occupation syndrome”, the disorientation & misconception about what’s healthy, what’s not & what type of diet is proper to our environment and the traditional Mediterranean products, as well as about the changes in the lifestyle of modern Greeks! Your recipes seem delicious and the photos look great! Thanks Eleni! Appreciate your comments. Yes, definitely the “occupation syndrome” is such a strong factor. 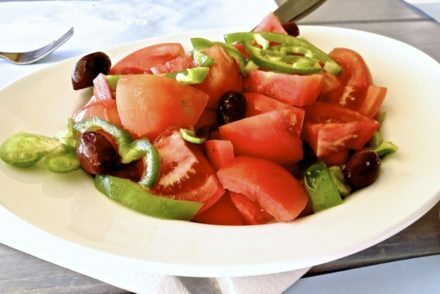 One thing I *love* in Greece, is that if you are too busy, as many modern Athenian working moms are, there is a company called ‘Mbarmba Stathis’ which sells frozen all the cut up veggies needed to make the lovely ‘ladera’ mixed vegetable dishes which Greeks love to eat as main dishes. (No wonder the Greek cuisine is so healthy! Imagine Americans eating vegetable dishes for a main course?!) All one needs to do is saute the veggies in your own olive oil and voila! Even the dill is included in the mix! Here in the U.S., it is so pathetic to see how frozen veggies are packaged as obvious ‘side dishes’. Now that Greeks in Greece are getting over their ‘affluence complex’ of the past few decades (aka: embarrassment over not eating meat and rich food like the Western Europeans and Americans), they are embracing these simple and healthy foods once again. 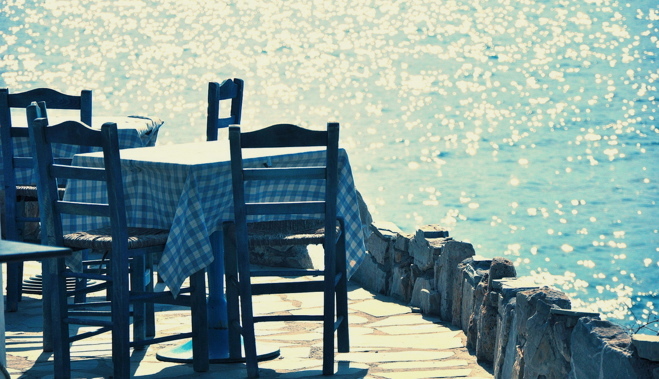 How I LOVE eating in Greece! It is the only place in the world I can travel to, eat out daily, and not gain weight! Na se kala, dear Elena, and at this point I will say ‘antio’ and forgive my verbose posts on your beautiful blog. What I have observed is this: Greeks, especialy women, are allergic to the gym. Their diet consists mostly of things made with white flour, sugar, butter,oil and salt. A lot of women believe that housework IS exercise, if that was the case they would all look like Olympic gymnasts. I know women who are so averse to working out they prefer to starve instead, however, starvation does not work because eventually they give in and start bingeing on the wrong foods and end up putting all the weight that they lost back on, plus more. They would rather have a root canal than hit the gym. I m 51 and work out with weights, machines and body weight exercises 5 times a week, also, I eat lean meats, fish, eggs, nuts, healthy fats, vegetables and fruit. Thank you Helen for your comments and congrats on working out. Although, I do not agree with the stereotyping. There are many reasons as I explained for this phenomenon. And until recently, Greeks walked a lot, they did not have large super markets which meant 2-3 trips to the local market every day carrying heavy bags etc. Also housework is a physical activity. Traditionally the mediterranean people who lived so long had a lifestyle that was very active which included housework, walking, swimming in the summer, working in the fields etc. there were no gyms. Housework WAS heavy physical labour in their grandmothers’ day, before automatic washing machines and other applances. I don’t know about that.. These all sound like justifications as to why many Greeks are overweight/obese. I mean, look at the paintings from the ancient times. The women depicted on those paintings are fat! And I’m pretty sure they didn’t have cars either back then to make a trip to the supermarket.. I am not sure to what paintings you are referring to, but if you look at the art, women are definitely not depicted overweight. But that may depend on what you consider overweight.Objectively though I have not seen women depicted as overweight in ancient Greek art. Women depicted in classical statuary or paintings were either idealised goddesses or ruling-class ladies. The latter didn’t have cars, but they did have slaves to do the shopping and cooking for them (though a ruling-class lady did work as an administrator). Often slightly plump (but not obese) women were considered the ideal in societies with general scarcity, as they were considered more fertile. In Crete which is where most the figures used to promote the Mediterranean Diet came out there isn’t an influx of non mediteranian food being consumed leading to obsity nor this notion that they’re no longer using olive oil (it is still the cheapest easiest oil to get for any local) it’s simply that the poverty levels in the mid 19th century and the activity levels of the inhabitants are no longer there. People are eating more then they were with less activity then their ancenstors. Your article here does a bit of romanticism on tradition. You can say the things you’re saying in relation to the main land but it doesn’t explain Crete which on my personal visits to me has a very easy explanation….people are less mobile, and are eating more. Thanks for your comment Manos. While we both agree that physical activity is one of the reasons (I mention it in my article as well). I would disagree on the nutrition aspect, studies in Crete as well as colleagues (researchers, nutritionists) who work in Crete and experience firsthand the situation who I have interviewed, have shown that people in Crete (as in the rest of Greece) are simply eating a more Westernized diet (more meat, more processed foods etc.). i recently visited Greece for the first time. I participated in a volunteer vacation living with two scientists and four other volunteers to study the Dolphins on the Gulf of Ambrasia. The field house we lived in was in the village of Vonitsa (Bovitoa) pop. 4,000. I took a local bus from Athens to reach this village which was a five hour bus ride through the mountains and sea coast picking up locals on the way. My experience in Greece was so different than you describe. The entire time I was there, 6 days, then 3 days in Athens & some islands, I never saw any fat people!! In Vonitsa we shopped at a local small grocery for fresh veggies & fruit which came in regularly, fresh bread from the bakery, fresh fish from the fish store and meat from the meat store. Olive oil with a wine vinegar mister was always on our table. We were all from different countries and took turns cooking. We all were impressed at the freshness of the food every day. I never, even in Athens, saw any junk food being sold (snacks etc). We bought freshly made ice cream from the ice cream stores and little Greek pastries from the bakeries for snacks. The wine was even different than I’ve had in the US, more body and less alcohol. Even the Greek cafes had delicious fresh foods everywhere. Obviously, this is only a small part of Greece. So sorry to hear this healthy lifestyle isn’t everywhere in Greece!! Arley thanks for sharing your positive experience, it sounds wonderful. Although in all the large towns and cities, you do not need to look further than the local kiosk (periptero) to see unhealthy snacks being sold. That being said Greece has a higher rate of overweight rather than obesity as you see in the U.S. I only spent one day in Greece (a daytrip on a ferry while I was studying in Italy) so I can’t judge it, though the Greek Canadian friends I know would agree with your assessment. But while there is junk food in Italian supermarkets, there is much less than in French, Dutch or British supermarkets and certainly North American supermarkets. (The ones I shop at most nearby here in Montréal are ethnic Italian, Greek and Southeast Asian so while crisps exist there, there aren’t whole aisles of them). I agree that “the gym” is a bit of a red herring; nobody but the élite had the gym in southern Europe; daily exercise such as walking, cycling and gardening (as well as a git of goatherding and shepherding) were the baiss of an active lifestyle. Thanks for the explanation. It is indeed ironic. I assume you’re a nutritionist and do appreciate your not blaming the “western diet”. As an American, it always strikes me as an insult. There are so many options in a supermarket here or even a fast-food place. One doesn’t have to choose unhealthy items, nor overeat, in any case. Your reasoning for the switch in Greek attitude toward food and activity as a function of wealth and being too busy makes sense. Thank you for your input Ron. Yes, there are so many factors that contribute to obesity. Registered Dietitian Day 2012- Who are the Real Nutrition Experts?